This delicious and super easy low calorie Maryland Crab Cakes Recipe is perfect as an appetizer, main dish or side dish. Most traditional crab cake recipes use a lot of mayonnaise and are fried, thus making for a pretty high PointsPlus meal. But by altering the recipe with some healthier ingredients and using a high fiber breadcrumb mixture, each of these tasty cakes are just 3 Points each. The first time I made these, I divided the mixture into 12 mini crab cakes instead of 6 full size ones, to use as an appetizer, and they were perfect! Everyone was asking for the recipe, and NO ONE could tell they were Weight Watchers friendly. So if you are cravin’ some good ol’ fashioned Southern Crab Cakes, enjoy this guilt free version and save your Points for dessert! My healthy twist on this popular Southern Recipe will leave you surprised that these delicious Maryland Crab Cakes are actually low calorie and Weight Watchers friendly! With just 3 Points each, they make the perfect guilt free appetizer idea or dinner. Try serving over a bed of greens and turn it into a low calorie crab cake salad for lunch. There are so many ways to enjoy it! Stir egg white briskly with a fork. Add crabmeat, ¾ cup of the breadcrumbs, mayonnaise, lemon juice, green onions, peppers, dry mustard, parsley, Old Bay seasoning and salt & pepper; mix well. Coat a baking sheet with non-fat cooking spray. Put the remaining Fiber One breadcrumbs in a shallow dish. Form the crab mixture into six 1/2-inch-thick patties. Lay each patty in the dry breadcrumbs, and then turn each to coat them well on all sides. Pat the crab cakes firmly into rounds and then place them on the prepared baking sheet. Preheat the broiler. Broil the crab cakes until nicely browned, about 4 to 5 minutes. Turn them gently and broil until heated through and browned, 4 to 5 minutes longer. In a food processor, combine cereal, salt, garlic powder, onion powder, paprika and pepper and pulverize to a fine powder or breadcrumb like consistency. I agree with Mary L. This was a great recipe, but there was far too much salt. I too suggest leaving salt out of the bread crumbs. I also did not use the peppers. I made these last night and they came out great, I wouldn't leave out the onion and peppers, I liked the taste and texture they added, authentic or not they tasted yummy! The only change I would make for next time is less salt in the Bread crumbs, they were a little too salty for my taste. That and maybe a little hot sauce. Will definitely make these again! Any ideas for a WW friendly sauce to serve them with? I agree with Laaloosh! When you add peppers (red or green) and onion you take away from the delicate taste of the crabmeat. This is not a Maryland crab cake recipe. 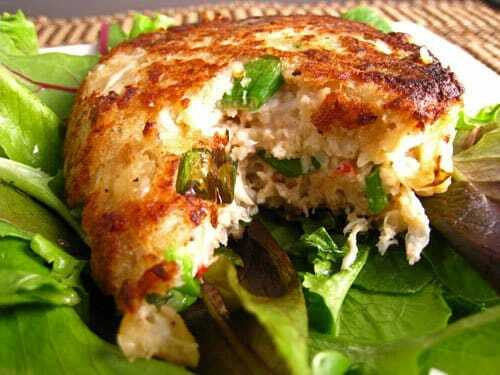 Made these crab cakes for dinner this evening (minus the peppers)….DELICIOUS! Hey, I just came across this and CANNOT wait to make these! My husband's family is from Maryland and always makes HIGH FAT crab cakes aka fried, so this makes me so happy that I can bring my own LOW FAT, LOW CALORIE crab cakes :) Thanks so much!! I made this recipe over the weekend and thought it was great! I used the red peppers, but not the green peppers (only because I didn't have any!). My husband hasn't stopped talking about how great they tasted. As with any recipe, modify to meet your preferences but be mindful of the points. Enjoy! I understand that you are trying to make it lower in fat & calories (Fiber one is an inspired idea), however, don't ruin the delicate flavour of the crab by adding peppers and onion. Try it without. They taste much better because the crab isn't overpowered by onions and peppers (which I do love in other dishes and on their own). Adding those two aren't Maryland. Please don't ruin perfectly good crab by adding onion and green/red pepper. That's not a Maryland crab cake. However, I do see that combo from Virginia & Delaware companies. Maryland crab cakes in Baltimore, Annapolis & the Eastern Shore will not have any of that other stuff. Traditional is: 1 pound backfin crab meat, &frac12; cup cracker crumbs or bread crumbs, 2 eggs, &frac14; cup mayonnaise, 1 teaspoon seafood seasoning (Old Bay, Wye River, or the stuff from the crab man downy ocean), &frac12; teaspoon white pepper, 2 teaspoons Worcestershire sauce, 1 teaspoon dry mustard. John Shields also tends to publish very traditional Maryland recipes. This new twist on the traditional Maryland Crab cakes recipe is to make the crab cakes lower in fat and calories and healthier all around, and that is the point of my whole blog – to take popular recipes that people know and love and make them more Weight Watchers friendly so that they can still be enjoyed by Weight Watchers members without using up all of their daily points plus allowance.